Char has Mondays off but teaches 17 classes Tuesday through Friday. BoomerTrekker Note: The following story is by Char Koppi about her first week teaching at Hangzhou Foreign Languages School. Definition: Something that can be accomplished easily. Every week I plan to start my classes at Hangzhou Foreign Languages School (HFLS) with an idiom and some example of American slang. I like to give a real-life example to demonstrate the meaning of the word or phrase. I get on my bus, the 86, every morning about 6:30. I count six stops and get out when I see the little blue awning on the Little Elephants store. I wait a few minutes for the 310 to arrive and hop on. I ride for about 45 minutes until I see the gym at HFLS, a very prominent landmark, and get off the bus. The busses at this time of day are not crowded so it is an easy ride to school–A Piece of Cake! Not so the ride home. I catch the 310 outside of school on Wednesdays at 4 p.m. The bus is busy and crowded and gets more crowded with each stop. It is raining. The windows are fogged up. I can’t see my landmarks for the bus stop at which I need to transfer. Just as I am about to panic, I remember the little card I carry in my purse with my stops written in Chinese characters. I show the pretty young girl across the aisle and point to my stop. She puts up two fingers indicating that I get off in two stops. At the appropriate stop she looks at me and nods. I squish through the passengers to the exit door. In a few minutes the 41 arrives to take me to my stop near the apartment. As the 41 makes its stops, every high school student in Hangzhou gets on my bus. (I am sure because we are packed body-to-body, not one square inch of wiggle room.) I can’t see out the front of the bus for all the people in my line of vision. The rain and foggy windows make it impossible to see out the side windows. Again, I am nervous about missing my landmark. This time I can’t even move to pull out my card. I stretch my neck trying to see, not sure where I am. Wait, wait! I think that is my landmark just ahead. I move toward the exit door, pushing and shoving and stepping on feet to get through the masses of students. I get to the exit door, move down to the step—and the bus driver closes the door. I pound on the door with my fists and cry, “Let me out!” A Chinese student yells to the bus driver to open the doors and I am able to exit the bus. I stop for a moment and take a deep breath before I walk the two blocks home. In short, my bus ride home is a terrible experience: Bummer!. By Friday of my first week of school I have the bus routes and my landmarks firmly planted in my head so I can avoid repeating Wednesday evening’s harrowing experience. This is the four-story HFLS library, the centerpiece of the school’s campus. HFLS is 15 km, about 9 miles, from our apartment here in Hangzhou. It is a public boarding school for students of high scholastic aptitude. The campus is as beautiful as any college campus I have been on in the US. It consists of twenty-eight buildings, beautiful ponds with fish swimming and lush green landscaping. To my delight, the four-story library is the centerpiece of the campus. Other buildings include those for administration, classrooms, dorms, cafeteria, and the gym with an auditorium used for athletic endeavors, drama, and other programs that require a large indoor space. The school has about 3,000 students and 300 teachers. All students live in the dorms. There is also a faculty dorm for the 30 or so teachers who live on campus. These are mostly young single teachers who find it convenient to live on campus. The student body consists of Juniors 1, 2, and 3 (think 7th, 8th, and 9th grades) and Seniors 1,2, and 3 (think 10th, 11th, and 12th grades). There are four foreign teachers this semester. Kelly and Amanda are spring, 2011, graduates of Kansas University, both journalism majors. Phillip is a mature teacher from New Zealand whom I have met only briefly. He is here with his wife who teaches in another program on campus. I am the fourth foreign teacher. The other three teachers live on campus, while Joe and I are in the apartment in town. Bao, the go-to guy for the foreign teachers, helps us get set up for our stay. He helps me figure out my bus route to school. He helps us set up a bank account with an ATM card into which our paychecks will be deposited. He gets a school lunch card for all of us. We each receive 200 yuan a month ($32) on the lunch card so that we can eat lunch in the school cafeteria. I can easily eat a good lunch for 4 or 5 yuan a day (80 cents). We can also use the lunch card in the school store. If we don’t use the 200 yuan in a month it rolls over to the next month when another 200 yuan is added to the card. Bao tells me that this little perk is not just for foreign teachers, but for all teachers at HFLS. Because I have to take the bus to school everyday, the school also provides a 300 yuan bus pass for me ($48). My round trip bus ride is 8 yuan daily. And, Bao will assign a room to me in the teachers’ dorm in case I want to rest when I have two or three hours between classes!!! 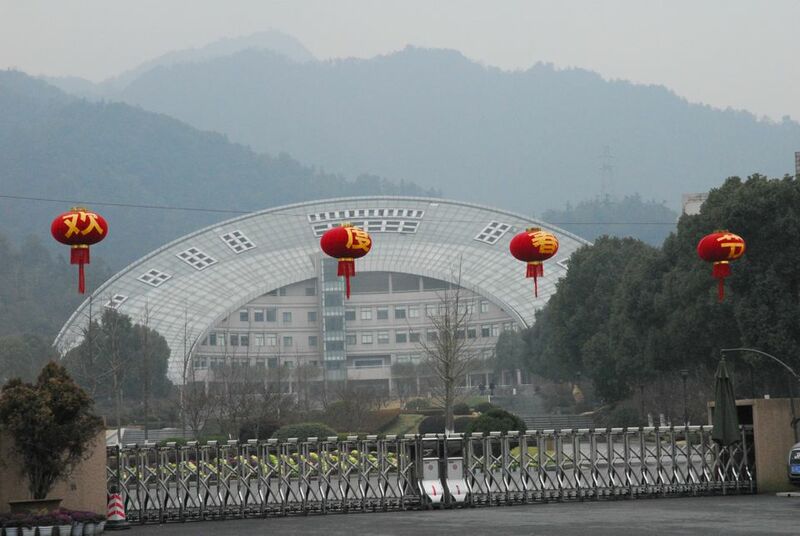 The Chinese really have it figured out: the library is the centerpiece of the school and teachers are treated well. I have completed my first week of teaching. I teach 17 40-minute classes a week. 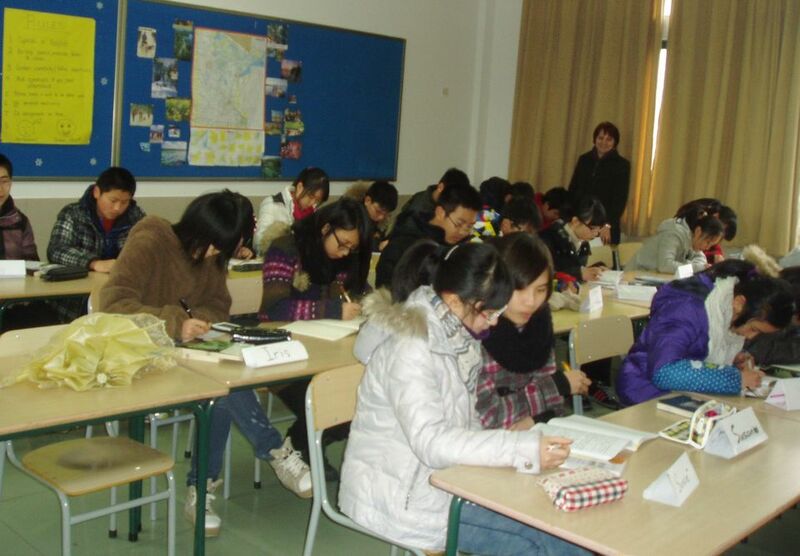 The normal class load for foreign teachers is 16, so I will be paid and extra 100 yuan ($16) a month for the extra class. I see each class one day a week. I teach levels J2, J3, S1 and S2. Basically, I can teach the same lesson all week; I just increase the depth and difficulty of the lesson depending on the level of the students. I have anywhere from 14 to 28 students in a class. The more usual class size is about 25. My teaching day starts at 8 a.m. every day but ends at a different time each day. I have no classes on Mondays, so I don’t have to go to school. Tuesdays I teach four classes and am finished at 11:30. Wednesday I have five classes and finish my day at 3:40. I am free from 12:00 to 3:00 on this day and may make use of the dorm room Bao is providing. Thursdays I have two classes and finish at 10:25. Friday is a long day with six classes in a row with an 80-minute lunch break between the fifth and sixth period. I finish teaching at 2:00 on Friday. I am able to leave campus as soon as I finish with my last class of the day. I usually eat lunch at school and then catch the bus home. 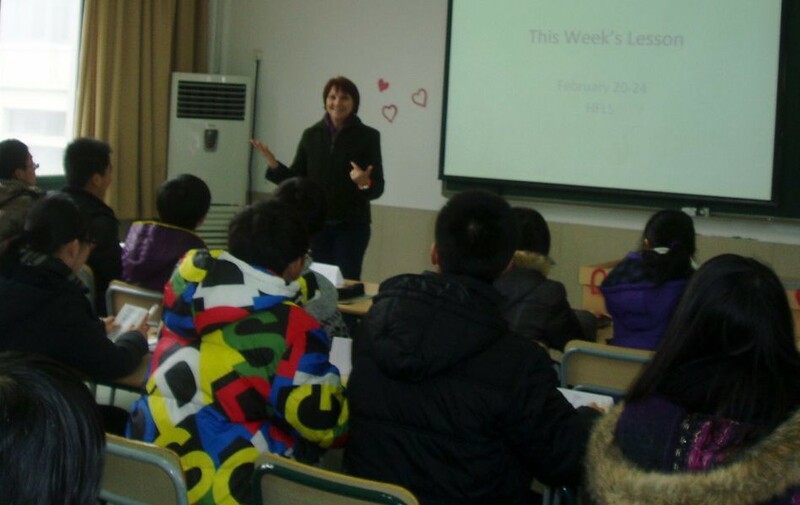 Phillip and I are the “mature” foreign teachers, so we are given permanent classrooms and the students come to us. Bao was very upfront about the fact that we have the permanent classrooms because we are the older teachers. Kelly and Amanda travel to the students’ classrooms. This is the norm for Chinese teachers as well. Students stay in the classroom and the teacher comes to them. My classroom is pretty standard fare, consisting of tables and chairs for the students. I have a desk with a computer and a ceiling-mounted projector which I will probably use daily. No chair for the teacher. I also have a free-standing heater/AC unit in the corner that I turn on first thing in the morning. The heater takes the chill out of the room, but the students and I keep our coats on all day because the room never really gets warm. We have had cold, damp, rainy weather for most of the week so I have been very thankful that I brought my long underwear to China with me. The hallways leading from one classroom to the next are open to the outside. When it rains, the hallway floors are very slippery and many of the stairs don’t have handrails. I have to inch along the halls trying not to slip and fall. This is one of the reasons I wear jeans and my athletic shoes to school just about every day. There are custodians, all women, who try to sop up the water periodically with mops, but it is a never-ending task on those rainy days. My first week with students is delightful. Their regular Chinese English teacher brings the class to my room and introduces him/herself to me. I think they like having their students go to the foreign teacher because the regular teacher gets a break during the time the students are with me. All the students have chosen English names, which they use in their English classrooms. Most are standard names like Kevin and Jeff and Zoe and Linda. But, then, there are the more flamboyant names like Soap, Ultraman, Weskar, and Winy. One day I will have them stand and give me their English name and tell me how they chose it. That may be a whole story in itself. For the first week, I tell each class that today I will do all the work. All they have to do is watch and listen. After today they will do all the work. I have prepared a slide show of 10 or 12 pictures of Joe and me, our house front, the patio, my children, and grandchildren. The students are so attentive and interested as I talk about the pictures and tell stories about my family. We have a lot of laughs together. All the students are very taken with the pictures of my house. The J 2 and 3 students applaud when they see the picture. Almost all the students here live in apartments, probably laid out very much like the one Joe and I live in. Single-family dwellings are a rare and impressive phenomenon for these kids. The students are also very impressed with Joe’s size and Katherine’s, Andrew’s, and Nathan’s height. The students are very kind and polite. I find the junior students a little more eager and interested. The senior students have had foreign teachers for several years, so I am not such a novelty to them. Everyone loves my feeble attempt to show them that I can kind of say “please” and “thank you” in Chinese. And they especially like my story about ordering street food without knowing how to tell the vendor what I wanted. And we laugh when I tell them that I don’t understand how Chinese children learn to read Chinese characters. I tell them that I hope they will learn a little about American culture from me. And, I will look to them to help me learn Chinese customs and culture. So after an awesome week, I am finding my feet. Look at you! You are both the “new kid on the block” and “over the hill” all in one setting! Fascinating! Thanks so much for sharing. Take care. What a kick your posting is! (idiom) Oh, I remember so well about the Chinese schools. Sounds like you are enjoying yourself Char. Keep us posted, love to read about what is happening in your life. wow!!! that is so awesome you guys are living life like it should be lived-so much fun to hear about you and so proud of you!! Love you, baby sister. You are so cool!